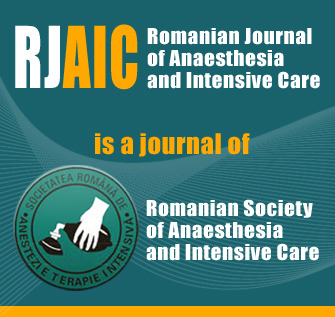 The Romanian Journal of Anaesthesia and Intensive Care (Rom J Anaesth Int Care) is intended for anaesthesia and intensive care clinicians, and for specialists in emergency medical care, pain research and pain management. The principal aim is to stimulate and promote scientific discovery by publishing research papers and manuscripts accompanied by editorials written by experts in the field. The editorials seek to place the research findings in the appropriate clinical context, highlighting how the information is directly applicable to patient care and how it benefits the clinician and the patient. The Journal also seeks to inform and update anaesthesiologists about clinical and regulatory developments by publishing reviews and educational materials such as Clinical Guidelines of the European Society of Anaesthesiology and those of our Romanian National Society. A major effort is spent in ensuring that case reports continue to be published. The Journal believes that serving its readership by publishing such reports is essential, and did not wish to cease their publication regardless of their potential impact on the Journal’s impact factor. We believe that one of the major services that our journal provides is to educate its readers about “extraordinary” cases, those rare events, therapies, successes, and failures, in the hopes that the information will ultimately benefit other clinicians, and the patient. Ethics in publishing has long been a major concern and focus of the journal, with the aim of preventing scientific misconduct. The Journal has recently instituted new requirements for the use of anti-plagiarism software and is in the process of collaborating with publishing companies and other journals in providing educational material regarding publication and research ethics, research fraud, conflict of interest policies, segmenting research (“salami” publishing), and patient and research subject rights.